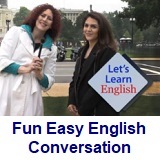 ﻿ Fun Easy English - new classroom free online classes english language lessons speaking listening writing reading february 18. 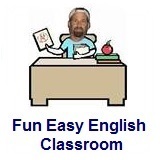 Today in the Fun Easy English classroom you will learn some male and female vocabulary. Hi. In the classroom today you will learn male and female vocabulary. Many words in English are used only for male things or female things. Sometimes a word can be used for either male things or female things. Knowing the difference is extremely important. Many English language students confuse the words he and she or his and hers. Many students confuse words like actor and actress or waiter and waitress. Pay close attention to the conversation or the story and determine if a word is male or female or both. This is an important part of English vocabulary to know if you want to avoid making mistakes. Being able to recognize which words are male and which words are female is very important. 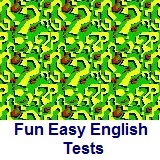 This is a test to see if you know which English words represent male things and which words represent female things. For each question decide if the word is male, female, or both. There are 50 questions. Good luck. Conversation Lesson 49 - Operation Spy!